Golden Eagle Lodge sits proudly in the heart of a magnificent landscape & welcomes you with a warm embrace. Your eyes will light up & a smile will come to your face when you see the Lodge – its 6800+ square feet are crowned with a “Colorado” blue sky metal roof & surrounded by a 3-sided wrap-around deck. Tucked against towering rock bluffs, the Lodge takes a commanding position overlooking pine & aspen meadows with snow-capped views of Pikes Peak & surrounding mountains. A rare authentic log structure, constructed with 57 ft seam-less lodge pole pine logs, up to 14” diameter, from the mountains of Kalispell, Montana. 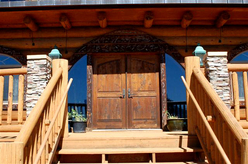 The Lodge is built with superior products & artful craftsmanship. Enter though custom double doors to a sunny atrium, past a double stairway & into a 2-story Great Room with soaring 30’+ ceilings. A focal point is its massive rock fireplace with 20’ hearth, 19’ mantle & copper accents. A finishing touch on this magnificent feature is a hand-painted mural above the firebox of an eagle’s flight over the property. The Lodge offers 5 large bedrooms (each w/private bath), a commercial grade / gourmet kitchen, 2 laundry rooms (one on each level) & an upper loft. Other features include Italian porcelain tile, hardwood & carpeted flooring, radiant heat, Anderson windows & 12 skylights. The deck provides a place to entertain or truly relax – to enjoy a sunrise or see a million stars on a clear night. When activity calls, the location could not be more perfect. Hike to a high point on the land with 360 degree breathtaking views of the surrounding mountains & valleys. Here you will find a serenity & deep inspiration from the grandeur of the mountain scenery. 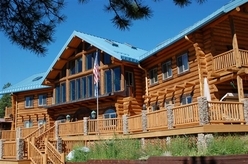 The Lodge also serves as a jumping off point for numerous excursions & a broad spectrum of recreational opportunities (fishing, hunting, boating, rafting, biking, hiking & skiing). 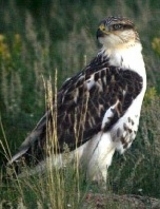 Ideal for a family / corporate retreat, allow your spirit to fly like an eagle at Golden Eagle Lodge!